Marinara, 3 cheeses, & choice of 3 toppings on a toasted hoagie. Our "Philly", made with 1/2 lb of choice top sirloin steak (sliced paper thin), onions, mushrooms, melted Swiss cheese, & special seasonings. All grilled & piled on a freshly baked hoagie. Grilled chicken, crisp romaine lettuce, diced tomatoes, parmesan cheese & Caesar dressing wrapped in a warm tortilla. Choose your meat: Turkey roast beef, pastrami, ham, or salami. Served with lettuce, tomatoes Swiss cheese, & mayo on a hoagie, sourdough, wheat or rye. Pickles & red onions on request. 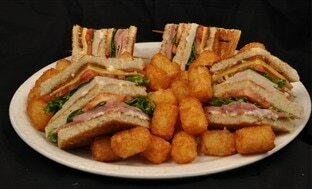 Turkey , ham, smoked bacon, lettuce, tomatoes, Swiss & American cheese & mayo served on three pieces of toasted sour dough. Golden fried chicken strips with Swiss or American cheese, lettuce, tomatoes & mayo. Served on a hoagie roll. 1/2 lb tender eye of the round piled high. Au jus on the side. Chicken, ham, bacon, cheese, lettuce & tomatoes, tossed in honey mustard dressing & wrapped in a warm tortilla. Like Rocky, our Italian sub is a champ! Made with ham, salami, pepperoni, Swiss & American cheeses, pepperoncini, lettuce & tomatoes, & sprinkled with Italian dressing & Parmesan cheese. Pickles & red onions on request. Tender breast of turkey, bacon, Swiss, tomatoes, lettuce, avocados, & chipotle mayo on rye. Mouth-watering meatballs steeped in Marinara sauce and smothered in provolone cheese served on a toasted hoagie.